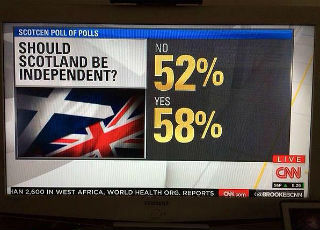 My guess is that the CNN accidentally published partially correct numbers when they announced the preliminary results where the Yes vote achieved 58%. That would be perfectly logical under the circumstances: the preliminary polls show 52% against (that’s what they put on the first line) and the final result was closer to the 58% in favor due to the high turnout of the population activated by the circumstances. I think, Scotland voted positively on their independence but they would never see the real results of that referendum. So why would this actually be the case? No country in the world is eager to break up its territory and let the country to become smaller. Every country wants to get more territory, more people, more resources. All wars in the history were fought about just that. Why would you think that trend would ever reverse? If Britain suddenly let a part of its territory to break apart that would be a clear signal of failure to all the other countries around the globe. It would also be send a signal of possibility of staggering proportions. Suddenly, Flanders would have a referendum for breaking off from Belgium, Northern Italy – from Italy, Catalonia – from Spain and so on. There are so many territories that were annexed as the result of wars that Europe would split into twice as many countries within a couple of months. This is simply unimaginable. Countries, governments, empires do not work like that. A country that allows its territory to be annexed without dire consequences will be quickly consumed by its neighbors. Britain will never let any of its territories go and they will do everything they can to keep them in check. There is no incentive whatsoever for Britain to give part of itself up for any reason. The referendum is a clever trick to calm into submission the population of the province that wants independence. The result of that referendum is predefined, the result will be that people in their majority desire to stay with the “rightful owner” of the land. The main result is that this referendum will be now quoted every time the people of Scotland mention independence, it is now a “done deal” for the next 10-20 years. It is a very good move for Britain and a very bad move for Scotland. Although, of course, the officials and unofiicials that organized this referendum will be better off with Britain than without. The others… well, who cares. Posted on 2014-09-22 by Tigr. This entry was posted in Various and tagged Britain, en, false, independence, more people, more resources, more territory, Politics, poll, popular, protect, referendum, result, rigged, Scotland, vote. Bookmark the permalink.